IN an effort to restrict refugees coming into the country, government has rejected a number of asylum claims prompting the intervention of the United Nations which is pleading on behalf of the failed applicants. UN is asking government to reconsider some of the asylum applications at Tongogara Camp in Chipinge, Manicaland Province and other refugee camps. 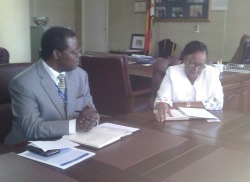 The United Nation High Commission for Refugees (UNHCR) Country Representative, Robert Tibagwa, made the plea to Public Service, Labour and Social Welfare minister, Prisca Mupfumira, in Harare Monday. Mupfumira admitted government had rejected quite a number of asylum seekers, saying they were willing to review some of the cases. Tibagwa approached the minister after visiting Tongogara Camp last week where he discovered that some refugeesâ€™ applications had been turned down. â€œWe do not have enough resources to take care of the refugees since we are struggling with so many challenges but, I am glad that UNHCR has asked our government to reconsider the applications,â€ Mupfumira said. But Tibagwa said support would be extended to refugees and there was a possibility of reviewing the rejected asylum seekers. â€œThose with no issues like criminal records and any other issues will be identified,â€ Tibagwa told reporters. Republic of Congo (DRC) where most of the refugees come from (80%). Other refugees are from Rwanda, Burundi, Sudan, Eretria and Ethiopia.